Cockroaches are a high risk pest to have in the home; they carry a range of serious illnesses including salmonella, dysentery, gastroenteritis and typhoid. Cockroaches droppings have also been linked with increases in eczema and asthma. Apart from the health risks cockroaches are particularly unwanted in the home. 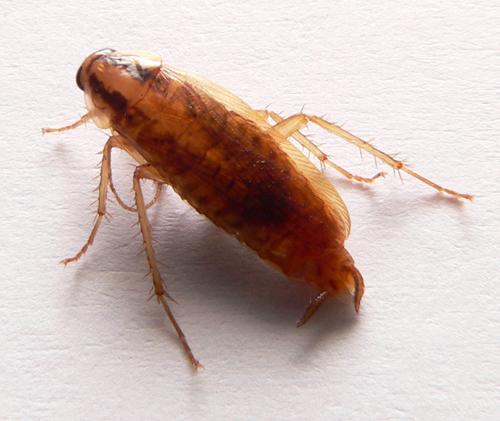 Not only are they unsightly but cockroaches produce an obnoxious odour that taints food and any objects they come into contact with. Cockroaches breed very quickly but are also highly resilient so a speedy response is essential to ensure a cockroach infestation does not become established or spread to neighbouring properties. The wings are as long as the body or slightly overlapping in both sexes. They scuttle & are very good climbers, due to the sticky pads on their feet, which gives them the agility to climb up smooth surfaces including glass. If conditions are warm enough they will also fly. German cockroaches prefer warm, wet locations with high humidity such as kitchens, bathrooms and laundry areas. Damage – cockroaches eat almost anything, food stuffs, organic goods including leather, books, paper, clothing and animal matter (such as hamster or rabbit droppings – as well as their food). They will also consume packaging and plastics. Dealing with a cockroach problem is something best left to the professional at Pesky Critters. We use non-toxic gels and quite often infestations can be dealt with without the need for spraying. However every infestations is unique so we will advise you on the steps we need to take to rid your home and business from cockroaches. If you have problems with cockroaches then let us take care of that for you.